NEW Maxim™ Advanced for Better Protection and Profits! Totally new Maxim™ Advanced uses the latest technology to deliver the very best levels of protection available. Not only does it protect against oil and water based spills and dry soils but it protects fibers from the toughest dye stains "from the inside out"! Maxim™ Advanced has extended coverage as compared to traditional protectors (1200 sq. ft. per gallon residential, 2400 sq. ft. commercial). In addition it uses half the water so carpets dry twice as fast! And, Maxim™ Advanced is priced 17% lower than traditional protectors! 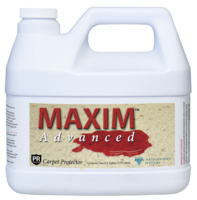 Maxim™ Advanced is a totally new formula that represents the cutting edge of carpet protectors today. It uses state-of-the-art, environmentally safe fluorochemical technology to protect against damaging dry soils as well as both water-based and oil-based spills. But the real key is how Maxim™ Advanced coats fibers with a stain barrier to protect them from difficult dye stains "from the inside out". Traditional protectors rely on a repellency barrier across the top of carpeting to protect carpet fibers. And while such protectors perform well, especially when spills are cleaned up immediately, once a spill penetrates the protective barriers of repellent protectors they immediately bond to the fiber, creating difficult to remove stains. Because Maxim™ Advanced protects the fiber completely, not just at the top, spills will not bead up and then soak through to create stains. You and your customers will be able to remove tough stains easily even when they've been there for months! Maxim™ Advanced Means More Profit for You! By applying Maxim™ Advanced you are delivering the best possible care of your customers' carpet. But the "cherry on top" is all the additional profit you'll earn! Maxim™ Advanced is priced so you can provide your customers with the very best protection available at a far greater profit than traditional protectors! And you can save up to 30% more if you take advantage of the Interlink Smart Buy program! Every major survey reveals that over 80 percent of consumers were interested or very interested in the benefits of having protector applied after professional carpet cleaning. Maxim Advanced has been proven to sell on up to 80% of residential jobs using our simple demonstration. If you simply ask if the customer would like protector and hand them the brochure then 40% will buy. Add as little as $14,000 and up to $66,000 per truck per year by selling Maxim™ Advanced. Now, you can eliminate extended drying times because Maxim™ Advanced uses half the water of other protectors! Plus, special dispersing agents make sure all the carpet is thoroughly protected. Your customers will love how easily spills are removed and how great their carpet will look between cleanings. And Maxim ™ Advanced has the kind of dry soil protection that will prevent fiber damage and appearance loss in traffic areas that causes so much carpet to be replaced prematurely. They'll especially love how easily their carpet will come clean at the next cleaning! Many consumers are under the impression that their olefin and polyester carpets are "stain proof " and therefore don't need carpet protector. And while these fibers are naturally stain resistant when it comes to dye stains, olefin and polyester carpets still need protection. But now you can help your customers protect their olefin and polyester carpets from this damage by protecting them with Maxim™ Advanced. That's because, unlike traditional protectors, Maxim™ Advanced has been designed to adhere to olefin and polyester and will provide extremely high levels of protection against oily and dry soils. In fact, Maxim™ Advanced can be used on all carpet fibers-even wool!